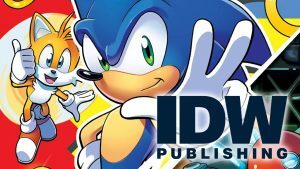 San Diego, CA (February 2, 2018) — At breakneck speed, IDW Publishing is fast approaching a brand new era of Sonic the Hedgehog comics starting with a new #1 issue. Anticipation for this exciting launch runs high and, as a way to express gratitude to the fans for their patience, the series will kick off with a new issue each and every Wednesday during the month of April. Following the release of the first four issues, the ongoing series will continue on a monthly release schedule from May onward. Longtime Sonic scribe Ian Flynn has been tapped as the series writer. His contributions to the Sonic comic mythos cannot be overstated and his return to the franchise has been met with overwhelming fan approval. Flynn will be joined by a stable of talented artists, some who will be familiar faces to readers, and others who will be making their Sonic comics debut. Among those contributing to the first four issues are Tracy Yardley (interior art on issue 1), Adam Bryce Thomas(issue 2), Jennifer Hernandez (issue 3), Evan Stanley (issue 4), Tyson Hesse (main covers), Nathalie Fourdraine (variant covers), Rafa Knight (variant cover), Jamal Peppers(variant cover), Jonathan Gray(variant cover), and Sonic Mania artist Kieran Gates (variant cover). Each issue in April will feature Sonic teaming up with a different ally: Tails, Amy Rose, Knuckles the Echidna, plus the introduction of a brand new character, Tangle, who will make her debut in Sonic the Hedgehog #4. It's awesome to see Evan Stanley, Jamal Peppers, Jonathan Gray, and even Jen Hernandez returning to the comics! But I wonder if Matt Herms will join in soon? My dream wish list for returning artists is J Axer, Spaz, Steven Butler, and Diana Skelly.